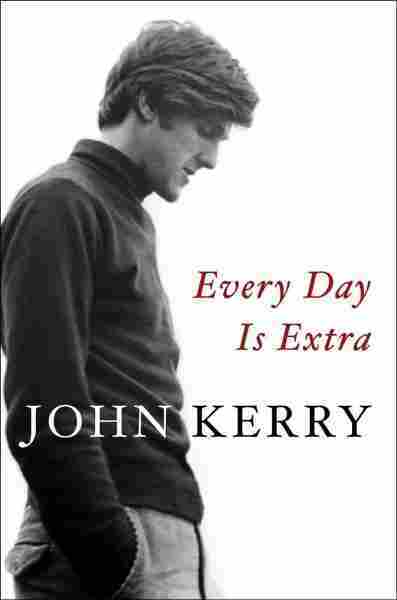 In 'Every Day Is Extra,' John Kerry Focuses On His Time In The Political Arena Given the contrasts in personality and policy — and how much energy President Trump has spent on dismantling what Kerry worked for — one can't help but want to hear more from the former senator. The initial chapters on Kerry's childhood, college years and early private life are emotional, vivid and literary. That's especially true for the chapters on Vietnam, as Kerry recaps his steady drift from a patriotic Yale student who volunteered for the Navy, to an officer facing the daily dangers of swift-boat patrols along jungle rivers, to the shaggy-haired peace protester who denounced the war in front of the Senate Foreign Relations Committee. Relying on detailed diaries that the former senator and secretary of state kept in Vietnam, the book captures the dangers of ambushes, the frustration of missions with questionable or nonexistent strategic value, and the day-to-day life of young soldiers and sailors who are slowly realizing they're being shot at for a political mistake. But as Kerry's public figure grows, the memoir's narrative shrinks. Key moments in Kerry's career — especially his 2004 presidential campaign — are rushed through in a stew of dense paragraphs loaded down with images of meeting rooms and airplanes, and the names of politicians and political staffers. Kerry spends just a couple paragraphs recounting his search for a vice president, and devotes even less time to the 2004 convention and his decision to pick State Sen. Barack Obama as its keynote speaker. But he dwells for several pages on the decision of whether or not to opt out of public campaign financing. As the book adopts the dense feel of the typical political memoir, it avoids the genre's most newsworthy feature: score-settling and behind-the-scenes accounts from politicians who no longer need to tend to personal relationships. To Kerry's credit as a friend and colleague, but detriment as an author, he doesn't provide many new, unreported details about President Obama, or longtime Senate colleagues like Ted Kennedy, Joe Biden and Hillary Clinton. It's clear Kerry has no real respect or warmth for his 2004 running mate, John Edwards. But embracing his patrician New England roots, Kerry merely flicks icy observations in the direction of Edwards, rather than taking him on full-blast. The most eye-grabbing: Kerry recounts Edwards telling him a graphic, painful story about encountering his dead son's body at the morgue. Telling Kerry the story as they met to discuss the vice presidential slot, Kerry writes that Edwards said it was so personal that he had never before shared it with another person. "Something unsettled me," Kerry writes. "It seemed too familiar. Teresa later reminded me that it was the exact same memory he had shared for years before at dinner." On the flip side, Kerry devotes pages and pages to McCain, who died last week at the age of 81. Kerry recounts a previously reported late-night flight the two men shared early in their Senate careers, and how the prisoner-of-war and veteran-against-the-war reconciled the different ways they had responded to, and acted in, that political cauldron. McCain and Kerry went on to lead a bipartisan effort to conclusively investigate remaining POW/MIA claims, as well as restore a normalized relationship with Vietnam. That chapter gets to the ultimate flaw in Kerry's book, which is entirely outside of Kerry's control. Both the Trump sdministration and the current political climate cast an inescapable shadow over it. You can't read a chapter about a Republican and Democrat working together to solve a complicated problem without thinking about how impossible that task would be in the modern Senate. Nor can you read blow-by-blow recaps of the final hours of negotiations for the Iran nuclear deal and Paris Climate Accord without acknowledging the Trump administration has since systematically dismantled both international agreements. In fact, the same goes for Kerry's entire career. He devoted his entire adult life to public service, and took the nuts and bolts of governing seriously. Briefing books and committee meetings make recurring appearances in this memoir. Like McCain, Kerry tried and failed to win the White House, which is currently occupied by the first person in American history to become president having never held prior public office or military command, and first to run on a tweet-by-tweet basis. Kerry, like most other Obama administration alumni who have written books, opted to focus on his time in the arena, rather than critiquing or responding to the Trump administration. But given the glaring contrasts in personality and policy, and given how much energy Trump has devoted to dismantling everything Kerry worked for, you can't help but want to hear much more from the former senator and secretary of state on current events, as well as the past.